Happy Summer Vacation to me…well almost! I do have one more day of school on Monday, but technically it feels like summer because the kids won’t be there! This year flew by didn’t it? It seems the older I get the quicker time goes. Do you feel the same way? Okay, onto the real reason you stopped by. 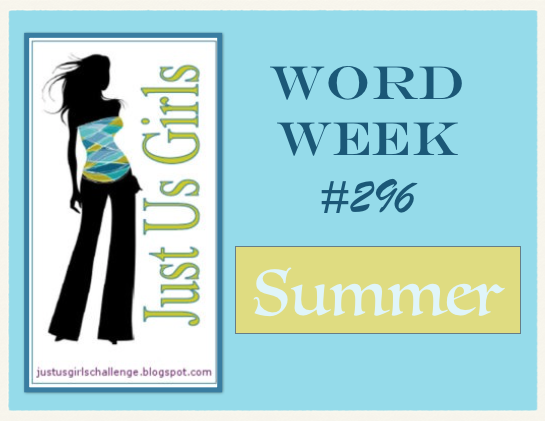 I am hosting our Just Us Girls challenge this week and it’s Word Week and the word I have selected is…..SUMMER….which I am sure you figured out by now. I am also linking this card up to two other challenges that I have been eyeing all week! 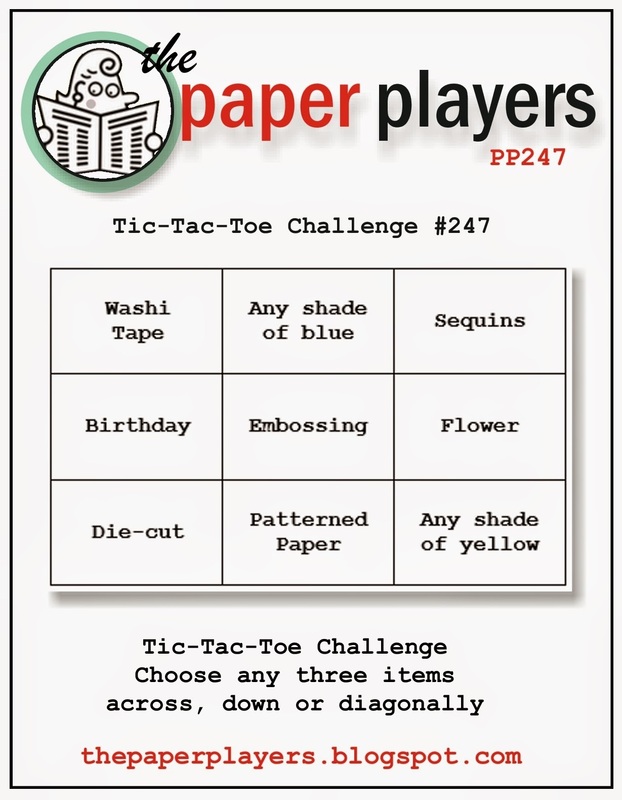 The Paper Players, where it’s a tic tac toe challenge where I selected the bottom row; die-cut, patterned paper and any shade of yellow. I MISSED IT! 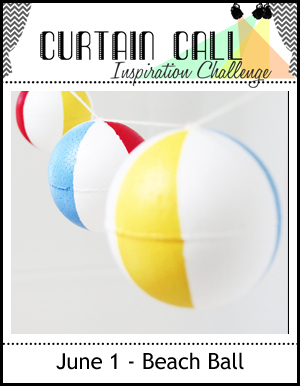 😦 I also would like to link up to The Curtain Call where the photo inspiration is a beach ball, which further inspired me to use the colors red, blue and yellow on my card. Plus nothing screams Happy Summer then a beach ball, right? I had a lot of fun combining these challenge and making my card this week. HOWEVER, this card would not have come to be if it wasn’t for me CASING this fabulous card by one of my idles…..Laurie Schmidlin. I am in awe of her work and have been for the past 8 years or so, if you have never been to her, blog I have linked up her name for you. You must visit! I also need to welcome Ros Crawford as our Guest Designer for the month of June over at JUGS. Welcome Ros! Please join us over at Just Us Girls and see what the talented designers did with the word of SUMMER. 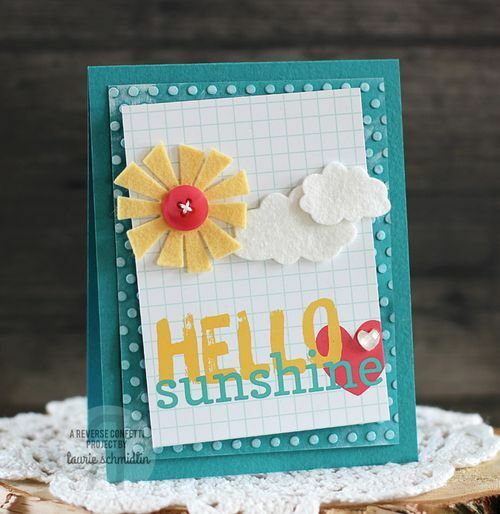 Card details: Lawn Fawn clouds and sun die cut. Hello Die is from Stampin UP. The heart was also made with a SU punch and the button is another die from My Favorite Things. The rest I think is pretty simple to figure out. FUN summer card! HAPPY VACAAAAAAAAAAAAAAAAAAAAAAATION! Enjoy!!! Pretty summery card. Love the in-laid sun and the clouds. Great color combo. I know you look forward to your summer. Enjoy. I love your summery card design. Great layout! Oh what a wonderful SUMMER card – so sunny and hope yours is full of fun and relaxation. Great take on our challenge this week Nancy. Beautiful summer card! Love the fun images and colors. Hope you have a great summer vacation! 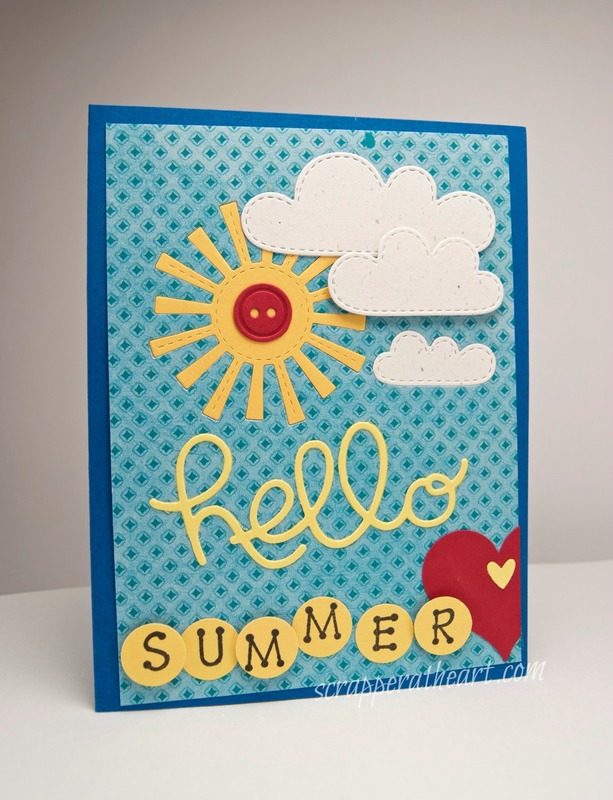 Thank you so much for having me join your ladies this month at JUGS … I love your sweet summery card … we sure could use some of that sunshine! This is so fun with those die cuts and brilliant colors! So perfect to depict Summer. Congrats on school finally being out! Love that little smiley face in the sun! Such a fun card! It screams summer! Great challenge this week! This definitely screams Summer to me! What a great card!